I liked book 1 in this series very much. 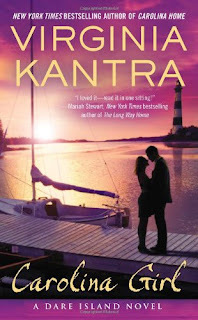 It reminded me of classic Nora Roberts trilogies like the Chesapeake Bay one. There was a nice romance, plus quite a bit of family drama that was presented as storylines that would develop throughout the entire series. At the end of Carolina Home, I wanted to know more about Taylor, the daughter of the youngest brother, who no one knew existed until a few months earlier, and I wanted to know what would happen to Tess, the three siblings' mum, after her car accident. The premise of this one, book 2 in the series, didn't really appeal to me. It's all about Meg, who left the island as soon as she could, determined to make it in the big city. She's almost there, with a VP job at a large company, a boyfriend who's the CFO at her company, plus a new condo they've just bought together. And then Meg is fired, and comes back to the island to lick her wounds. And there, hanging around, is Sam Grady, old friend of her brother's. Sam and Meg had a one-night stand right before leaving for university, and Sam seems to think there's unfinished business between them. The reason this setup makes me so wary is because it has the potential for being all about small town=good, big city=evil. And unfortunately, that's exactly what this book was, at least in the first third, after which point I gave up in disgust. Meg's life in New York is portrayed as all emptiness and cold sterility. She gets no satisfaction from her job, only money. Her relationship with her boyfriend is completely devoid of any warmth or caring. She has seemingly no friends at all. Because obviously, you can't get any sort of fulfillment or happiness while living in a big city, working in a senior management job, or with a man who doesn't work with his hands. Excuse me while I go cry in a corner about my horrible life. How deluded I've been, thinking I was happy. What does Meg need to be happy? Why, Meg needs a man who can bully, harass, badger and guilt-trip into wanting the sort of life he thinks she should want. Because he obviously knows best. And that's Sam. I hated his overbearing, entitled guts. My hatred started when he decides that Meg and her boyfriend clearly don't love each other because they haven't got married after 6 years together (no commitment or love without marriage, in Sam's worldview, even though his father has had more than a few failed marriages in his time). And then he keeps sexually harassing Meg, constantly cornering her and snogging and groping her, even though she has said quite clearly that she's with her boyfriend and is not going to cheat on him. But since Sam has decided this isn't a real relationship (too long without getting married, remember), Meg therefore doesn't have a real reson to reject his advances and all her protestations should be disregarded. Of course, Meg doesn't help herself by not being able to resist him when he kisses her. Kantra doesn't explicitly use the words "traitorous body" (*shudders*), but it's as if she had.